Clip in hair extensions have many advantages compared to the several other types of extensions and they are by far one of the best. They have become very popular in recent years as the range of color and styles improved. With clip-ins, you get incredible results and no one will know the hair isn’t all yours. Lengths range from 14 inches (armpit length) to 24 inches (waist length). Clip in hair extensions is discrete and lightweight. 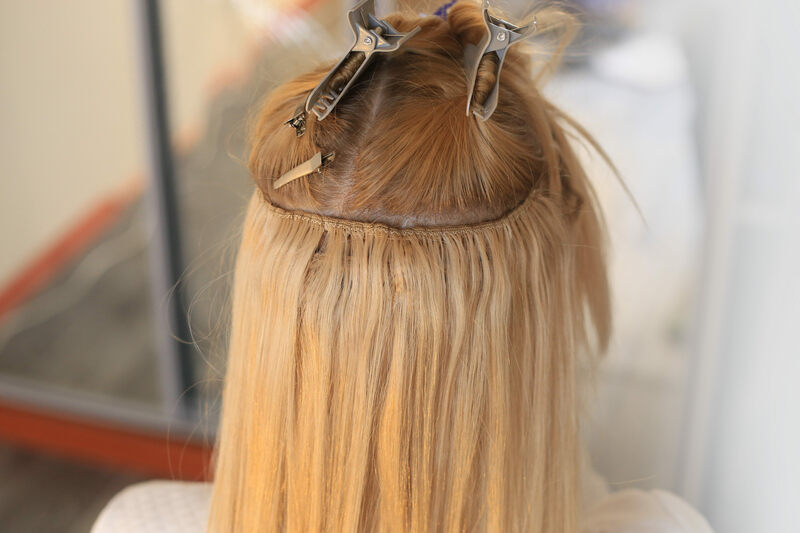 The clips are already installed on the hair extensions, so as soon as you receive your order, you can have longer and fuller hair in 5 minutes. Hair extensions can be expensive and that doesn’t include the installation or maintenance services. You will see that online and offline retail prices will greatly vary. Even among e-commerce websites, there are differences. If you would like to be able to obtain your clip in hair extensions at the lowest prices on the market, you might want to look for companies who eliminated the middleman. They are likely to be able to give you the best deals. As the hair is only attached by a clip, you can wear and remove these whenever you want. So if you have a special event or party but don’t want to have them every day, or even if you do, the choice is yours. They won’t require any professional attention, so once you have made your purchase, they can be installed instantly in roughly 5 minutes. The installation is so simple, anyone can do it, you don’t need any special tools, just a comb, and some clips. Moreover, clip in extensions is some of the most secure on the market. The clips are small but mighty, able to hold in place with minimal effort. Plus, these extensions are lightweight, which means that you won’t even feel them as you wear them, giving you a volume boost without the head or neck ache. Clip in hair extensions suits any style. You won’t have to change your own personal style if you choose to use them. Whether you want length, volume, color or all three, it all comes down to being yourself and expressing your own charisma, something that you can do with these amazing extensions for sure. Clip in hair extensions are easy to use and are designed to fully integrate with your hair, giving you a seamless blend with your natural hair. The installation process is very simple, you can install it yourself by following a simple guide to clip in extensions in the comfort of your own home. There pros and cons for both types, but still, in general, the number one factor tends to be your budget. Besides what you can afford you also want to think about how long you want one set to last. You might be willing to invest more if you will be able to enjoy your longer and fuller hair for months, instead of weeks. Because the synthetic hair is easy to color, there is a wider range of colors available compared to real human hair. That’s why if you want to get a wig for Halloween and you go to a dress shop, there are extensions in any color of the rainbow. The only disadvantage of synthetic hair in terms of coloring is that you can’t change it, once it is applied. On the other hand, the unit price is much lower, so can buy more for the same price. It can be shaped into the majority of hairstyles, from straight all the way up to the craziest of curls. You can really freely play with the style you want. These kinds of clips don’t have to be frequently washed, nor you need to use different kinds of products to make it look natural. or products to make it look or feel natural. Sop not only the unit price is much lower, but you also save all that money, that you would have spent on shampoos and oils in case of real human hair extensions. What you will need to do is semi-regularly rinse of the hair. These will be still much longer intervals than what normal have would require. You have similar freedom to synthetic hair extensions. You can change your style frequently, the only thing you need to watch out for is the heat you apply to the hair. As a rule of thumb don’t let any heated tool go over 250°C, that way you can avoid the risk of heat damage. Synthetic hair can be the perfect option for one, but you can’t get better quality than the real remy human hair. Be careful though, always confirm that the business you purchase your extensions from sells 100% quality human hair. Some will try to trick you and mix in synthetic hair. This practice adds bulk and lowers the cost. Synthetic hair is cheaper and there is a much much lower maintenance cost. On the other hand, if you take care of your human hair clip-ins a set of them can last you even several years, while synthetic hair loses its style and shape in a few months no matter what you do.